UC President Janet Napolitano—a former Homeland Security Secretary—supports the program, and Gov. Gavin Newsom has proposed spending an additional $17 million next year to provide similar legal services on California State University and community college campuses. 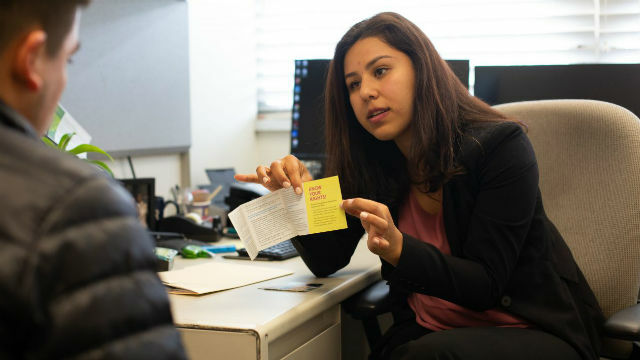 At UC Riverside, where the student body includes an estimated 800 undocumented and DACA-status students, Gutierrez helps her clients file renewal applications for the two-year DACA permits—under President Donald Trump, the program is not currently accepting new applicants—and counsels them about long-shot options for establishing permanent residency. She draws diagrams on notebook paper filled with boxes and arrows showing the possibilities and hurdles. Sometimes, she literally holds their hands. Here in California, she says, “I have my driver’s license, but it’s still kind of scary—always watching what I do, looking over my shoulder.” All the clients interviewed for this story asked CALmatters not to name them, to avoid compromising their immigration cases, so we’ll call her Marisol. The overwhelming majority of cases are like these—students whose path to citizenship is either lengthy and uncertain, or just nonexistent. The last time he renewed his permit, Luis paid a local immigration consultant $150 to help fill out the forms, which ended up sprinkled with minor errors. A fixture of many Latino neighborhoods, such consultants—sometimes referred to as notarios—work out of storefronts assisting clients with taxes and legal documents. But they are not attorneys, and sometimes make costly mistakes. An intern comes in with a letter: Citizenship and Immigration Services has rejected a residency petition filed by a student under a special program for underage victims of abuse and neglect. Applications for this program open periodically, then the window closes. By law, the application fee can be waived for those who can’t afford it, but the government has decided not to waive it in this case, Gutierrez says—she’s not sure why—and the client has missed the deadline. She will now have to wait until applications reopen, which could be years. In some ways, she says, she feels like a professional deliverer of bad news. But there are bright moments—like the client who decided she wanted to be a lawyer after talking with Gutierrez, the first undocumented attorney she’d ever met.